Ole Miss Women’s Soccer head coach Matt Mott will remain with the program until at least 2022 after receiving a four-year contract extension from the university. The extension comes on the heels of an NCAA Tournament appearance in which the Rebels knocked off the No. 25 Clemson Tigers in the first round. Mott took over an Ole Miss soccer program that had only achieved four NCAA Tournament berths in its 15 year history. Since his arrival in 2010, Ole Miss has made four NCAA Tournament appearances, including three of the last four, and a trip to the Sweet 16 in the 2016 season. 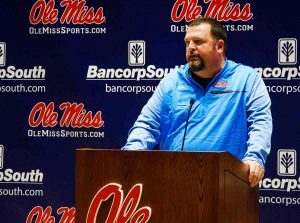 Ole Miss athletics director Ross Bjork announced the decision to extend Mott’s contract on Wednesday afternoon. Ole Miss soccer has seen unprecedented success under Mott, specifically the 2013 and 2016 campaigns. In 2013, just Mott’s third year on the job, Ole Miss finished 16-6-2 overall and 7-3-1 in league play, good for second in the SEC West, and hosted an NCAA Tournament game. In 2016, Mott led the Rebels to their first ever Sweet 16 appearance, which included a win over then-No. 7 Clemson in the second round. Furthermore, Ole Miss has ranked in the top four in the SEC in goals scored per game over the past seven years, leading the conference in 2013 and 2017. Moreover, three of Ole Miss’ top five scorers in school history have played for Mott. That list includes CeCe Kizer, Rafaelle Souza and Mandy McCalla. Before his career with Ole Miss, Mott spent time as an assistant at a different SEC West school: Auburn. Mott served as an assistant and later as an associate head coach from 1999 to 2006. He was named AFLAC National Assistant Coach of the Year for his 2002 performance during the Tigers SEC Championship season. In 2006, he made a move to be the top assistant at the University of Texas, where he would stay until 2010. His stint at Texas included two-straight Sweet 16 appearances and a No. 1 national ranking in 2007. Mott will look to continue the upward trend within the Ole Miss Soccer program. The 2019 Rebels will have a new look with top scorer CeCe Kizer graduating, but with Channing Foster returning, the Rebels should be solid offensively once again. “While I’m tremendously proud of the successes we’ve had in my time here, I still believe the best is yet to come,” Mott said.